The Cava-Corgi is not a purebred dog. 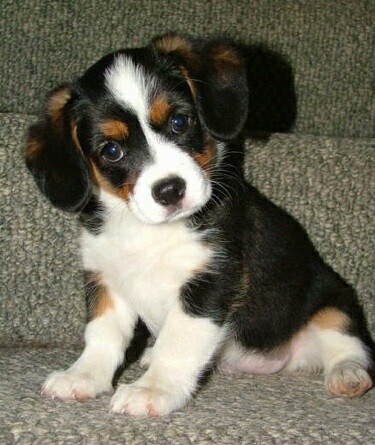 It is a cross between the Cavalier King Charles Spaniel and the Pembroke Welsh Corgi. The best way to determine thetemperament of a mixed breed is to look up all breeds in the cross and know you can get any combination of any of the characteristics found in either breed. Not all of these designer hybrid dogs being bred are 50% purebred to 50% purebred. It is very common for breeders to breed multi-generation crosses. "This is Maya. She is a 3-year-old Cava-Corgi. She weighs 24 pounds, and would be considered a medium-sized dog. 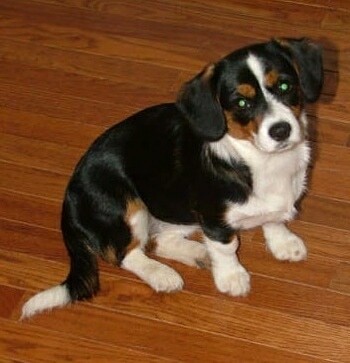 Her mother was a Cavalier King Charles Spaniel and her father was a Pembroke Welsh Corgi. When I first got her, she was scared of everything, but she has improved greatly. She is wary of strangers, other dogs and children, but she will accept attention from them. She is very mellow and sweet; her fears have not made her aggressive in any way. She is not very active; she spends most of the time on the couch or bed. She is always happy to see me when I come home and she likes to follow me around. The only complaint about her is that she sheds heavily; her hair does not require cutting but she must be brushed every 1-2 days. She is also prone to plaque buildup on her teeth. But overall she is the sweetest dog in the world." Maya is sister to Maggie, shown below. "My puppy, Maggie is a hybrid. 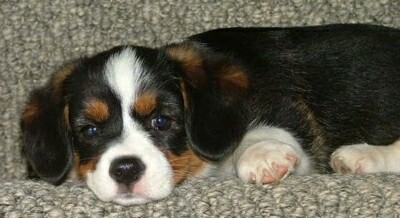 Her mother is a Pembroke Welsh Corgi and her father is a Cavalier King Charles Spaniel. I have heard of them referred to as Cava-Corgis and Corgaliers. A friend of mine likes to combine the Spaniel and Corgi into a Sporgi! I drove from NH to Ohio to pick up this little sweetheart. She seems to have taken all the best qualities of each of her breeds. She is very much a lap dog, like the King Charles Spaniel, and will calm down immediately when picked up and happily sit with anyone. She is smart as a whip, just like our purebred Corgi, although she also tends toward alert barking (like our Corgi!). Physically, she has a Corgi's little legs and long body with a long, lightly feathered tail that wags non-stop and the sweet Spaniel face with big brown eyes and soft floppy ears. I think she is going to be smaller than the typical Corgi in both height and weight and will more closely resemble the smaller framed Spaniel. Overall she is an amazing, alert, friendly little dog. She is especially gentle with little kids and naturally well-behaved. I am considering training her as a therapy dog for hospitalized children. Maggie is 9 months old in this picture." Maggie is sister to Maya, shown above.